Latitude 64's Gold Line "Flow"
Latitude 64 makes some great golf discs. 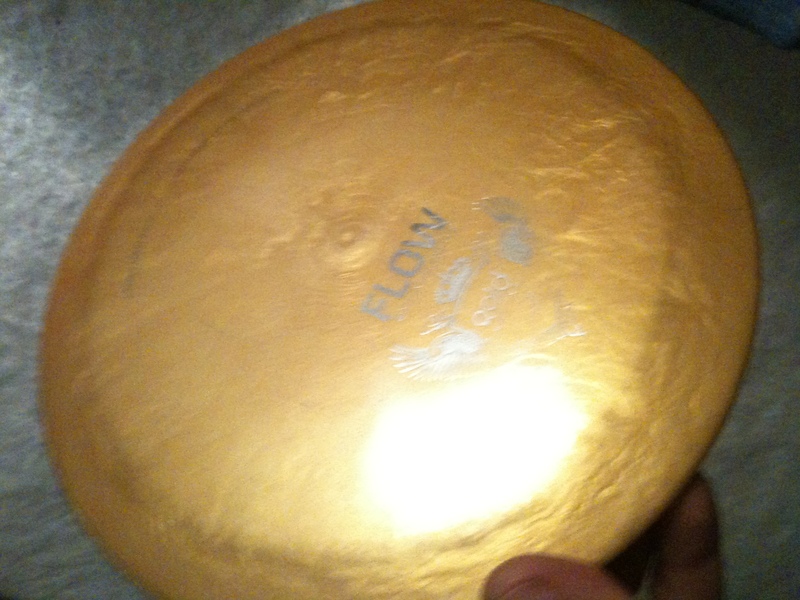 Their Gold Line distance driver, the “Flow,” became a mainstay in my bag this last disc golf season. It’s actually been one full year that I’ve thrown it, since I first got one last Christmas. I own one in the “Opto” plastic, but I haven’t thrown it enough to review it properly. For now we’ll focus on the “Gold” line version. I picked up a gold/mustard colored, sparkle infused disc- ordered online. I don’t recommend getting this color, as it is very similar to dirt, and dead leaves. I had one round in the fall this year that cemented my poor color choice- I think the group spent at least 5 minutes searching for that disc on three separate holes. Their blue is pretty vibrant, and their purple is also quite noticeable. I’d stay away from the gold and silver (unless you’re throwing in green grass all the time). As for the actual flight of the disc, their description is fairly accurate. They say it’s a “…high speed driver with good glide…” It’s glide IS pretty outstanding. It’s healthy to keep a realistic grasp on what glide is however. If you’re a beginner, you’re likely not going to get all the glide you’re expecting. Glide is what keeps the disc afloat, but it’s not a miracle that will take your disc further than you threw it. That being said, the disc will perform best when it’s thrower understands it’s preferred flight pattern. For the most part, the Flow wants to stay completely level. If you always throwing big hyzers, or if you’re natural throw is the come over the top of a driver and force it to “S” turn to get maximum distance, you won’t enjoy the Flow. However, if you’re able to keep things crisp, and pull straight across your body with a flat angle, the Flow can give you great results. Once I got the disc dialed in, it was my preferred driver on any open hole where I needed over 300 feet. My home course is very open, so I used it on the majority of the holes for the better part of 5 or 6 months. I actually only owned one Flow for most of the year, and it had a very minor break in period, and remained very consistent. 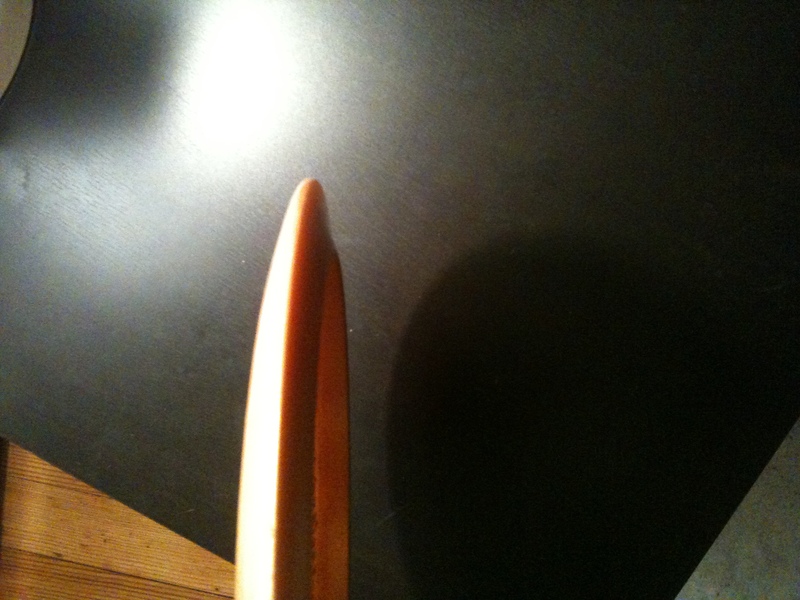 The rim of Latitude 64's "Flow"
This brings me to the next point- it’s stable. It’s not over stable, and it’s not under-stable. I could throw it full power (on the course, with control mind you) and never worry about turning it over. It still hasn’t become a flippy disc, and it’s been a full year. I find that it’s less stable than it used to be, but not in any sort of game changing way. Latitude 64 really does make spectacular discs when it comes to quality and durability. In terms of cons, and things I don’t like about this disc- I’ve already touched on one: you can’t throw it hyzer. Well, technically you can throw it anyway you want, but it won’t perform very well when thrown with any sort of height or angle. It likes to remain level, and use it’s domey shape to stay up in flight for a long time. The other big problem with this disc is it’s inability to fight the wind. If it’s windy, you probably shouldn’t throw the Flow. I think with a tail-wind you can get away with some nice results, but it can’t be gusty and unpredictable. If the wind causes a tilt from side to side, you’re not going to get a good result. On the other hand, I’ve discovered that it is a MONEY disc for upshots thrown as tomahawks. If you’re 70 feet away from a basket, and there’s a row of apple trees in front of you- just throw it like a baseball and release it vertical- aiming about 10 feet left (assuming you’re right handed), and the Flow will pancake out perfectly; either landing right at the basket, or even giving you a run at the chains as it swoops through horizontally. I discovered this on a hole where I’d consistently end up about 40 feet away, but 30 feet down a steep hill. I never make that shot as a jump putt, so a few times i’d throw my Flow at the basket in frustration as a tomahawk- with just a mini-snap- but I actually sunk the shot multiple times. It has a great natural ability to pancake out to upside-down quickly, and you can use that trick shot to take a lot of guesswork out of up-shots. My friends give me a look like I’m being foolish, or goofy when I throw like that, but it’s something I can throw with a lot of confidence- so I’ve stuck with it. I do recommend the Flow to players, but I’m not surprised either when people say there’s no room in their bag. If you’ve already established your bag, and you have a distance driver around the 11 or 12 speed rating, you may not need to try it. But if you want to try something different, and be rewarded for good form, I’d say pick one up. In terms of weight choice, it’s like any other driver- if you get max weight, it will take more power to make the disc fly well. For me, it’s coming down to a comparison of the Wraith and the Flow. I’ve thrown the Flow for a full year, and I enjoy the way it helped my game (especially that tomahawk/pancake throw), but I find the Wraith to be a much more versatile disc, which is decent in the wind. For now, the Flow stays in my bag. Peace out. This entry was posted in Equipment and Gear and tagged 64, disc, driver, flow, gold, golf, latitude, line, review. Bookmark the permalink.